The Battle of Alesia was fought September-October 52 BC during the Gallic Wars (58-51 BC) and saw the defeat of Vercingetorix and his Gallic forces. Believed to have occurred around Mont Auxois, near Alise-Sainte-Reine, France, the battle saw Julius Caesar besiege the Gauls in the settlement of Alesia. The capital of the Mandubii, Alesia was situated upon heights which were surrounded by the Romans. In the course of the siege, Caesar defeated a Gallic relief army led by Commius and Vercassivellaunus while also preventing Vercingetorix from breaking out of Alesia. Trapped, the Gallic leader surrendered effectively ceding control of Gaul to Rome. Arriving in Gaul in 58 BC, Julius Caesar began a series of campaigns to pacify the region and bring it under Roman control. Over the next four years he systematically defeated several Gallic tribes and gained nominal control over the area. In the winter of 54-53 BC, the Carnutes, who lived between the Seine and Loire Rivers, killed the pro-Roman ruler Tasgetius and rose in revolt. Shortly thereafter, Caesar sent troops to the region in an attempt to eliminate the threat. These operations saw Quintus Titurius Sabinus' Fourteenth Legion destroyed when it was ambushed by Ambiorix and Cativolcus of the Eburones. Inspired by this victory, the Atuatuci and Nervii joined the rebellion and soon a Roman force led by Quintus Tullius Cicero was besieged in its camp. Deprived of around a quarter of his troops, Caesar was unable to receive reinforcements from Rome due to the political intrigues caused by the collapse of the First Triumvirate. Slipping a messenger through the lines, Cicero was able to inform Caesar of his plight. Departing his base at Samarobriva, Caesar marched hard with two legions and succeeded in rescuing his comrade's men. His victory proved short-lived as the Senones and Treveri soon elected to rebel. Raising two legions, Caesar was able to gain a third from Pompey. Now commanding ten legions, he quickly struck the Nervii and brought them to heel before shifting west and compelling the Sernones and Carnutes to sue for peace (Map). Continuing this relentless campaign, Caesar re-subjugated each tribe before turning on the Eburones. This saw his men ravage their lands while his allies worked to annihilate the tribe. With the end of the campaign, Caesar removed all of the grain from the region to ensure that the survivors would starve. Though defeated, the revolt had led to an upsurge in nationalism among the Gauls and the realization that the tribes must unite if they wished to defeat the Romans. This saw Vercingetorix of the Averni work to draw the tribes together and begin to centralize power. In 52 BC, the Gallic leaders met at Bibracte and declared that Vercingetorix would lead the united Gallic army. Launching a wave of violence across Gaul, Roman soldiers, settlers, and merchants were killed in large numbers. Initially unaware of the violence, Caesar learned of it while in winter quarters in Cisalpine Gaul. Mobilizing his army, Caesar moved across the snow-covered Alps to strike at the Gauls. Clearing the mountains, Caesar dispatched Titus Labienus north with four legions to attack the Senones and the Parisii. Caesar retained five legions and his allied Germanic cavalry for the pursuit of Vercingetorix. After winning a series of minor victories, Caesar was defeated by the Gauls at Gergovia when his men failed to execute his battle plan. This saw his men execute a direct assault against the town when he had desired them to conduct a false retreat to lure Vercingetorix off a nearby hill. Temporarily falling back, Caesar continued to attack the Gauls over the next few weeks through a series of cavalry raids. Not believing the time was right to risk battle with Caesar, Vercingetorix withdrew to the walled Mandubii town of Alesia (Map). Situated on a hill and surrounded by river valleys, Alesia offered a strong defensive position. Arriving with his army, Caesar declined to launch a frontal assault and instead decided to lay siege to the town. As the entirety of Vercingetorix's army was within the walls along with the town's population, Caesar expected the siege to be brief. To ensure that Alesia was fully cut off from aid, he ordered his men to construct and encircling set of fortifications known as a circumvallation. Featuring an elaborate set of walls, ditches, watchtowers, and traps, the circumvallation ran approximately eleven miles (Map). 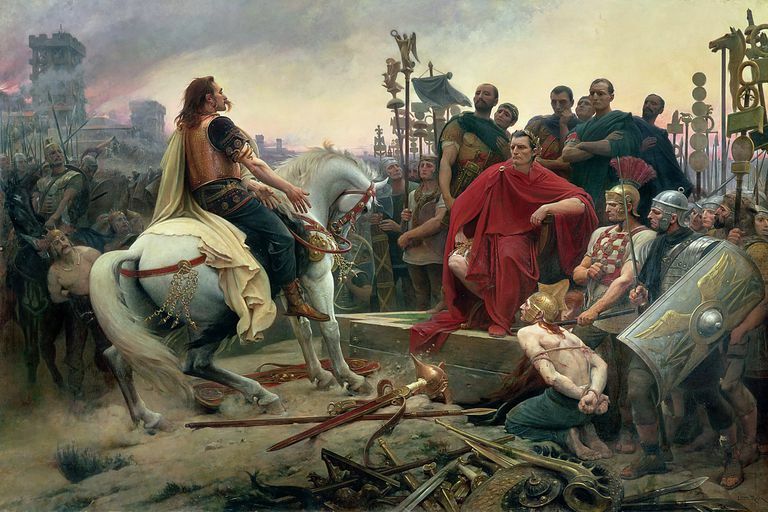 Understanding Caesar's intentions, Vercingetorix launched several cavalry attacks with the goal of preventing completion of the circumvallation. These were largely beaten off though a small force of Gallic cavalry was able to escape. The fortifications were completed in around three weeks. Concerned that the escaped cavalry would return with a relief army, Caesar began construction on a second set of works which faced out. Known as a contravallation, this thirteen-mile fortification was identical in design to the inner ring facing Alesia. Occupying the space between the walls, Caesar hoped to end the siege before aid could arrive. Within Alesia, conditions quickly deteriorated as food became scarce. Hoping to alleviate the crisis, the Mandubii sent out their women and children with the hope that Caesar would open his lines and allow them to leave. Such a breach would also allow for an attempt by the army to break out. Caesar refused and the women and children were left in limbo between his walls and those of the town. Lacking food, they began to starve further lowering the morale of the town's defenders. In late September, Vercingetorix faced a crisis with supplies nearly exhausted and part of his army debating surrender. His cause was soon bolstered by the arrival of a relief army under the command of Commius and Vercassivellaunus. On September 30, Commius launched an assault on Caesar's outer walls while Vercingetorix attacked from the inside. Both efforts were defeated as the Romans held. The next day the Gauls attacked again, this time under the cover of darkness. While Commius was able to breach the Roman lines, the gap was soon closed by cavalry led by Mark Antony and Gaius Trebonius. On the inside, Vercingetorix also attacked but the element of surprise was lost due to the need to fill in Roman trenches before moving forward. As a result, the assault was defeated. Beaten in their early efforts, the Gauls planned a third strike for October 2 against a weak point in Caesar's lines where natural obstacles had prevented construction of a continuous wall. Moving forward, 60,000 men led by Vercassivellaunus struck the weak point while Vercingetorix pressured the entire inner line. Issuing orders to simply hold the line, Caesar rode through his men to inspire them. Breaking through, Vercassivellaunus' men pressed the Romans. Under extreme pressure on all fronts, Caesar shifted troops to deal with threats as they emerged. Dispatching Labienus' cavalry to help seal the breach, Caesar led a number of counterattacks against Vercingetorix's troops along the inner wall. Though this area was holding, Labienus' men were reaching a breaking point. Rallying thirteen cohorts (approx. 6,000 men), Caesar personally led them out of the Roman lines to attack the Gallic rear. Spurred on by their leader's personal bravery, Labienus' men held as Caesar attacked. Caught between two forces, the Gauls soon broke and began fleeing. Pursued by the Romans, they were cut down in large numbers. With the relief army routed and his own men unable to break out, Vercingetorix surrendered the next day and presented his arms to the victorious Caesar. As with most battle from this period, precise casualties around not known and many contemporary sources inflate the numbers for political purposes. With that in mind, Romans losses are believed to be around 12,800 killed and wounded, while the Gauls may have suffered up to 250,000 killed and wounded as well as 40,000 captured. The victory at Alesia effectively ended organized resistance to Roman rule in Gaul. A great personal success for Caesar, the Roman Senate declared twenty days of thanksgiving for the victory but refused him the a triumphal parade through Rome. As a result, political tensions in Rome continued to build which ultimately led to a civil war. This climaxed in Caesar's favor at the Battle of Pharsalus.